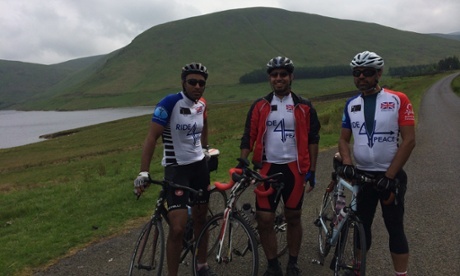 Last weekend I travelled up to Glasgow from London with 24 friends from the Ahmadiyya Muslim Community Cycling Club -all of us bright-eyed and excited to take part in a 600-mile charity cycle from Glasgow to London. It wasn’t a quick or easy decision to commit to such a mammoth challenge. What route would we take? What was the best way to keep the riders fit? Where would we stay? What would we eat? Who would drive the support vehicles? Wait, do we have any vehicles?! These were just some of the many questions we were confronted with. So, while the event would last only seven days, each day demanded about a month of planning and rigorous training. The group of cyclists came from across the north west, north east, Scotland and Greater London. They include doctors, scientists, students, professionals and me – a specialist in congenital heart disease. It is fitting then, that the charities we have raised £100,000 for are British-based Humanity First and the British Heart Foundation. We called our challenge Ride4Peace; a symbolic reference to a collective, national desire we all share – peace. On Sunday we embarked on what we were all hoping and praying would be the experience of a lifetime. The journey would take us down to the north east of England, by way of the amazing Scottish Borders. From there we would cycle through the Yorkshire Dales, up the Tour de France stretch between Kirklees and Sheffield and then across the Peak District to Manchester. Then we rode down the length of the Peak District and into Birmingham – where we are right now. Still ahead of us is a gruelling 125-mile route through Warwickshire, Oxfordshire, Berkshire and into London. Before setting off, we had an in-depth knowledge of every inch of the route. Yet the reality is that all the maps and websites in the world could do nothing to prepare us for the life-changing experiences, people and scenery awaiting us. I am personally accustomed to flatter straights on a daily cycling route to work as a research scientist in London, but found myself conquering new territory on the steep slopes in the Scottish countryside. The boys got a surprise boost on the steep gradients by the Scottish Borders’ Talla Reservoir when they realised the support vehicle couldn’t keep up with us despite our tired legs. The van had to backtrack to look for an alternate route while we overcame the climb. On the second day, still in the Scottish Borders, we had a slight scare when one of the cyclists found himself separated from the rest of the party not long after we had crossed over the border into England. With no money and no mobile phone signal for 40 miles, he was fortunate enough to be taken in by a kind couple, Tom and Margaret, who fed and kept him warm for several hours until he could be rescued by the support crew. A tremendous act of kindness! The Tour de France stretch between Huddersfield and Sheffield captured our imaginations. Suddenly 250 miles of tiredness left us and we raced across the route with everyone’s average speed rocketing. On the way we had the opportunity to stop at two war memorials, one being a Commonwealth War Grave. As a group of diverse and ambitious people, it brought home how the sacrifice of the fallen helped to afford us the opportunities we enjoy today. Most of the group are of South-Asian descent and felt proud that their forefathers had fought as part of the Commonwealth. To our surprise the lord mayors of Sheffield, Salford and Manchester all came to wave us along in Sheffield and Manchester. We were humbled to discover that the Lord Mayor of Manchester decided to make our welcome her first public engagement. The wife of the lord mayor of Salford was so delighted to see us that she jumped on one of the bikes, keen to join Team Ride4Peace. As with every place we visited, all of us left Manchester with tearful eyes and a wealth of happy memories to draw on. 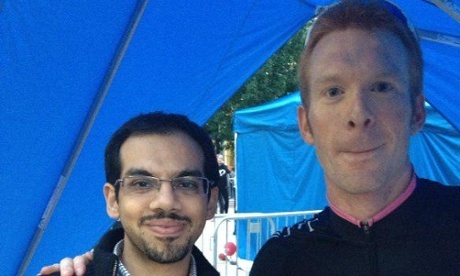 Before we could leave the north west we were ecstatic to receive a message of support from two-time Olympic champion cyclist Ed Clancy who was delighted with both our message of peace and charitable aspirations channelled through our love for cycling. His sentiments seemed to be shared by the crowds of people across our route who cheered, horned and waved along. 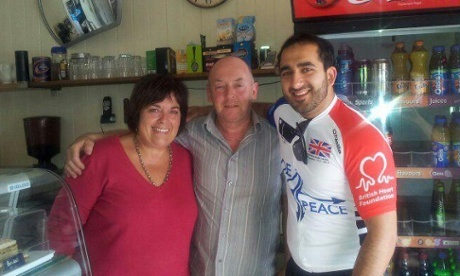 While our main reason for joining the Ride4Peace was to raise lots of money for charity, we also felt it incredibly important to offset the negative attitudes and stereotypes that a minority of people have about Islam. Four hundred miles on and it is in fact the amazing British public who have reinforced in our minds what a tolerant and kind country we live in. 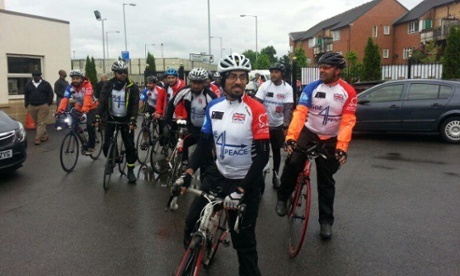 Share the post "Meet the Muslim cyclists riding for peace – and to combat Islamophobia"